We have the equipment and skills to perform a wide range of laboratory tests immediately on site 24 hours a day 365 days a year. This is invaluable in critical care and emergency situations. Early diagnostic testing allows faster and more successful treatment. 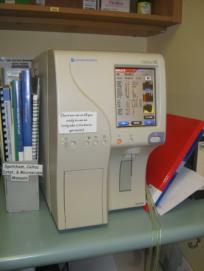 We have a range of machines that test a wide range of levels and give same day (often same hour) results. Routine pre-anaesthetic testing occurs in all major surgeries and is recommended for all other sedation/anaesthetic patients to ensure that we know as much as possible to treat your pet with the best level of care. 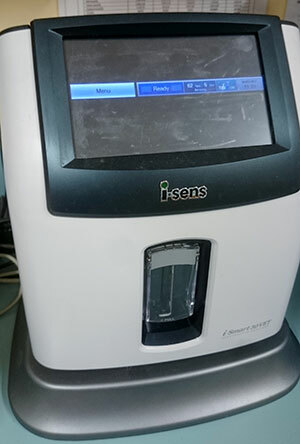 The Eclipse is our latest biochemistry analyser that uses state of the art wet chemistry to measure a number of blood levels. This is the same method used in large diagnostic labs across the world. The machine provides fast 24 hr analysing power that gives us valuable information. It enables us to assess thyroid levels in clinic as well as a wide range of kidney and liver levels. This performs what is called a complete blood count (CBC) which tells us about the red blood cells, white blood cells and platelets. We learn about anaemia, infections and clotting disorders and much more. 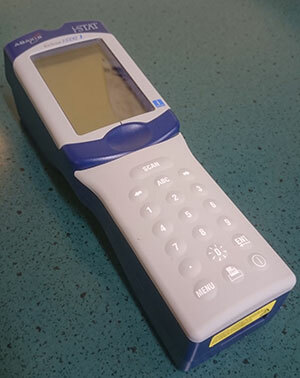 This hand held machine allows us to measure blood gas levels in our critical patients, as well as perform clotting times in emergency situations, rather than having to wait for an external lab. 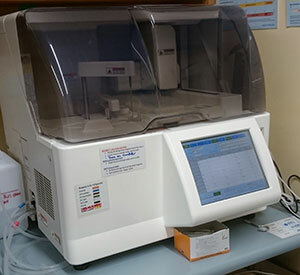 The clotting analysis is crucial in suspected rat poisoning cases as it allows early intervention and blood transfusion. Probably one of the most often used pieces of equipment here at Halifax! Almost every organ system in the body can be assessed by using diagnostic cytology (the study of cells). 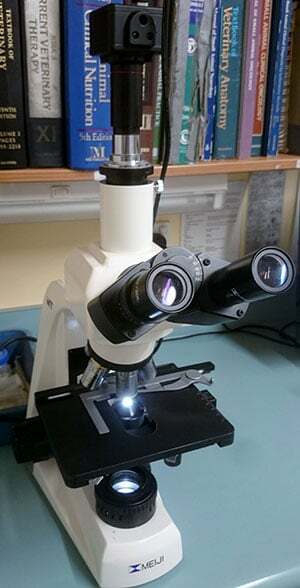 We are capable of immediate in-house cytology often giving definitive answers on the spot. The greatly reduces the use of inappropriate medication, speeds up recovery times and can also be used during surgery so that critical decisions can be made without delay. We simply could not work to our potential without access to this incredibly important diagnostic tool. A tumour map is a simple but effective tool for managing skin lumps and bumps in dogs and cats. In dogs 80% of superficial and subcutaneous (under the skin) lumps are benign. Just one out of five are malignant cancers. In cats a far greater proportion are malignant. How do you know which lumps are dangerous and need to be removed? The answer is a simple technique called fine needle aspiration (FNA) and cytology. FNA is the process of inserting a fine hypodermic needle into several areas of the lump. This collects a sample of cells which are spread on a glass slide, coloured with special stains that highlight various cell characteristics, and examined with a microscope. We can then determine from the cell type and characteristics whether the lump is a cyst, a benign or a malignant cancer. The malignant cancers need to be removed surgically. The benign lumps are usually only of cosmetic importance and can be left. As pets age they get more and more lumps. It gets difficult to distinguish which lumps have been previously tested and found to be benign from new lumps which appear. This is why a tumour map is so important. It records the type, size and location of each mass. Both the pet owners and the clinic keep a copy. That way pet owners can keep note if new lumps appear, and keep a track of any unexpected changes in lumps previously tested. These can then be checked and dangerous lumps can be dealt with at an early stage. We choose to travel from Mapua to the Halifax Vet Clinic, Nelson with our pets because we find the vet team to be highly skilled and extremely professional. Their diagnostic skills are excellent, and their verbal explanations and written documentation ensure the pet owners are fully informed of the problems, subsequent treatment and aftercare. Halifax has extremely sophisticated diagnostic equipment which enables fast, on the spot diagnosis, and hence quicker and more targeted treatment. The veterinary nurses also have a wide knowledge base and are extremely helpful, especially with phone queries. In view of the above we are totally satisfied our loved pets will get the best care and attention possible. A big thank you to Josie’s extended family at Halifax Veterinary Centre. I wish to thank you all for making Josie feel special not just to me but also to yourselves as well. Your care for her over the years is something that I will always treasure and respect. She was my special friend for nine years and I feel we were all lucky to have a share in her friendship.